Pine Barrens Conservation, The "Ecological Forest"
The site was a cornfield until 1997. That winter the corn stalks were plowed under and pine saplings planted. Today the pines tower 40ft above, prescribed burns keep them safe and healthy, and thinning opens the understory for habitat. "You can do a lot in 20 years," proclaims Bob Williams, President of Pine Creek Forestry and manager of the project. In the coming years he'll continue burning and thinning, opening space for biodiversity while occasionally providing "high-quality but limited" timber to the landowner. Rather than be clearcut, it will remain a biodiverse, ecological forest. 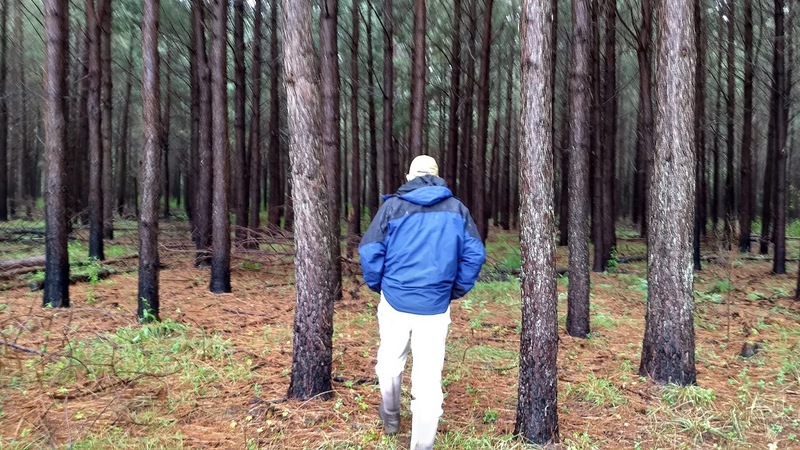 Are the private landowners interested in a timber plantation or nature reserve? "They're interested in me doing the right thing," Bob answered. They've given him free reign over the project, trusting his expertise, with his 30+ years forestry experience and the 148,000 acres he currently manages. 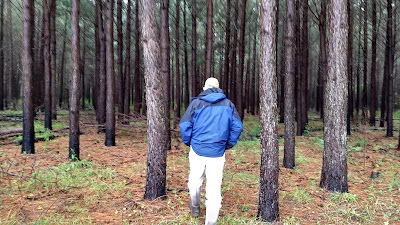 For Bob, the right thing is not merely silviculture, but ecology, "not degrading the land, but becoming part of it." Ecology (Eco, from the greek word oiko, meaning home) guides Bob's work. He may borrow plantation tactics initially -- plowing, seeding, thinning. But once the forest has established, "here is where we diverge, and the ecological forest begins." 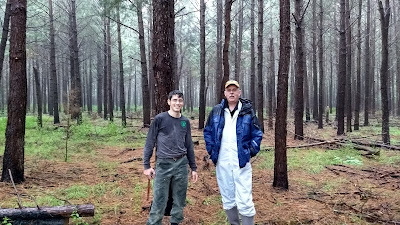 Unlike the plantation monocultures, Bob interplants multiple pine species like loblolly, pitch and shortleaf, while squirrels will introduce oak and other hardwoods. Eventually he may seed grasses and wildflowers to build biodiversity in the understory. The same forest in 2005. Photo credit: Bob. 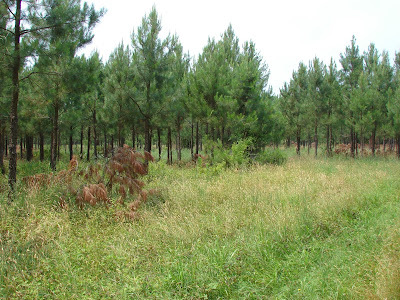 Occasional cutting of selected trees, or thinning, helps establish the needed biodiversity. The openings offer space for diverse species to grow. Thinning also creates an 'uneven stand,' with a diversity of structures and tree ages. 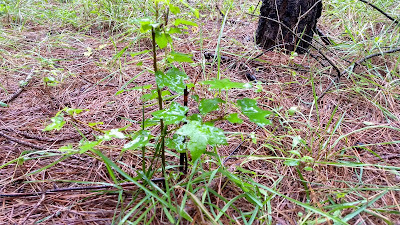 Furthermore slash from thinnings left on the forest floor provide benefits as in a natural forest setting. 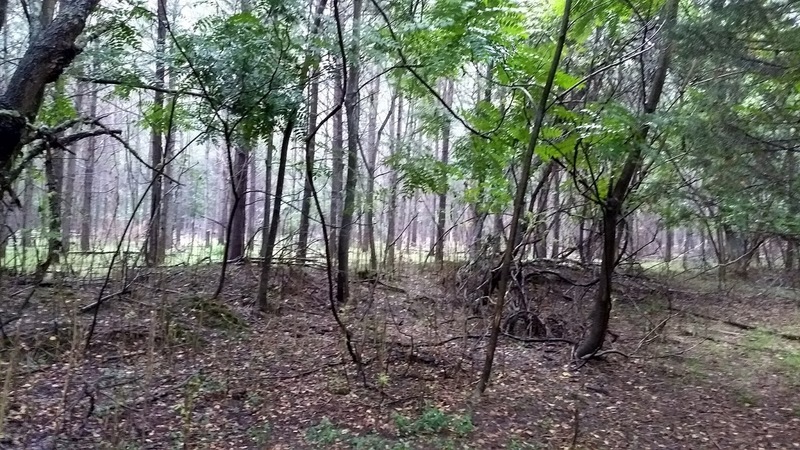 "This wood provides excellent habitat structure, attracts insects, then birds, and the cycle of life grows," Bob says. 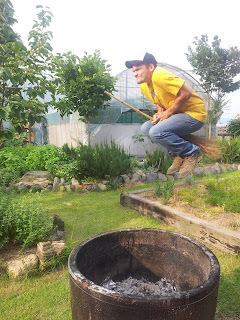 Another lesson of the ecological forest is the importance of fire. As we've seen, from the prairies of Ontario to the oak savannas of Iowa to the longleaf pine forests of Louisiana, America's ecosystems evolved for thousands of years with periodic, low intensity fires. They rejuvenate the fire-dependent species and prevent the encroachment of others that would gradually displace them. Furthermore, fire prevents the buildup of fuels and the inevitable catastrophic fire, like we saw destroy Bastrop State Park in Texas. Fire suppression has been the greatest ecological problem, according to Bob. "It's a national crisis." Invading Sweetgum stunted by fire. Fire also helps restore the forest's historic, "park-like" appearance, explains Bernie Isaacson of NJ DEP. 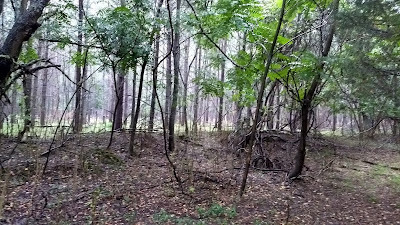 With fewer, larger trees and a clearer understory of grasses and wildflowers, early settlers reported this more open structure that they could easily drive a wagon through. For thousands of years Native Americans used prescribed burning to maintain these conditions. A powerful tool, fire created open grounds for hunting, regenerated berry patches for foraging and clearer routes for traveling. Today returning our forests to a balanced, natural state "requires the use of fire - without fire our hands are tied," says Bob. Bob with a burning understory. Towards the rear of the site, a scene supports Bob's call for restoration work. These plots had been abandoned earlier than 1997, so when the project began they had been overgrown with invasives like autumn olive and ailanthus. A bulldozer stripped the weeds, pushing them into long piles, or 'windrows.' Not planted with pine like elsewhere, the windrows offer a glimpse of the site's fate had Bob not intervened: still "patches of weeds." Invasive alianthus clutters the site's windrows. As Bob explained while we toured his Atlantic White Cedar sites, humans have the ability (and the moral obligation, as Bernie explained) to restore ecosystems and sustainably manage them. This is the conservationist school of environmental thought. Preservation, on the other hand, would favor purchasing the land and fencing it off, defending a "patch of weeds" against interference from "vermin" (i.e. humans), to borrow Bob's expressions. Meanwhile, humans inevitably need forestry products: paper, furniture, homes. Until we learn to live otherwise, we should be harvesting them from more local, ecological forests. For more on Bob's work and the need for restoration, see Atlantic White Cedar - A Case for Conservation.